You can go to Google itself and enter the search term www.musicweb-international.com followed by the search term. 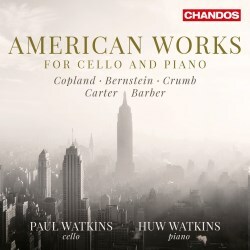 Whilst they take a sabbatical from their volumes devoted to British cello works – or possibly they won’t add to the four volumes so far released – the Brothers Watkins turn their attention to a single disc devoted to a quintet of American works. The first of the three cello sonatas is Barber’s youthful Op.6 of 1932. This is the work at which cellist Orlando Cole attended as midwife and physician, though it was English cellist Felix Salmond’s concert performance that particularly impressed Barber. Fortunately Cole was taped in it years later, live in concert at Curtis (in 1973, to be found in a superb Barber box on WHRA) and it was also taken up by Piatigorsky, whose 1947 Columbia 78rpm set was never released at the time but has recently appeared on another WHRA box. Meanwhile Raya Garbousova’s still well-regarded 1947 recording was fortunately issued and has long remained my lodestar for this work. The Watkins duo match Piatigorsky and Ralph Berkowitz’s tempi every step of the way but – more to the point – they deal justly with the sonata’s expressive richness and are especially deft in the Presto central panel of the slow movement. Negotiation of the tempo variations in the finale is one key to a successful performance of this work and this is a structural test passed with conspicuous success here. Elliott Carter’s 1948 Sonata was dedicated to Bernard Greenhouse and is a well-balanced four-movement work that enshrined early manifestations of ‘temporal modulation’- or metric modulation if you prefer. Whilst not one of his most vivid works it’s notable for the pulse lengths in the slow movement and for the strong sense of delineation of the two parts which take on an almost fixedly independent role at times. Seven years after Carter’s sonata George Crumb produced his own Sonata, opening with a Fantasia, continuing with a Theme and Variations and ending with a Toccata. Crumb enshrines both Bartókian and Baroque elements in this richly appealing work whether in the freedom of the fantasia or in the frankly pastorale elements of the central theme. The Toccata finale is memorably gruff and brittle in places, again drawing on some more Bartók lexicon. This leaves two non-sonatas. Bernstein’s Three Meditations from his 1971 Mass were arranged by the composer for Rostropovich. In a performance note Paul Watkins advises the listener that Huw substitutes small bongos for Bernstein’s requested tapping ostinato on the piano lid. This works nicely, so far as I’m concerned. This is a serious triptych and it draws on the chromatic theme from Beethoven’s Ninth Symphony in the central Meditation. The finale of the three though is inspired more by the spirit of the unfettered folk dance, though even here the music slows to a quiet reflective close. The Watkins’ care over articulation and dynamics pays rich rewards. Finally we are treated to Copland’s Waltz and Celebration from Billy the Kid, arranged by the composer and dedicated to Piatigorsky in 1952. The incisive performance ends a well-programmed disc on a high. Fine notes, fine sound and a really well played recital.